This is a jQuery plugin by which you can easily implement some captcha codes in four different fun and game like captcha models. This plugin is thought for one page website. When enabled it adds a smooth smart scroll navigation to a single page site. Navigation arrows to scroll to previous and next section, and the scroll to top button are enabled by default too. Insert text, images, videos, forms etc. as you would into any page on your website. Nothing except your needs and imagination stand in the way. Nuxion jQuery – Responsive UX Navigation Menu Bar is a small jQuery plugin that is used to create modern navigation bars that support unlimited menus, flexible layouts. Beta is a simple responsive menu, optimized for mobile & touch devices. It follows the popular trend of “flat design”, having a simple but usable and easy to integrate design. Magic Slider and Carousel will help you to create the next generation of sliders, using the CSS3 transitions for layers and an ultra-smooth KenBurns effect. PINCHZOOMer is an easy to setup jQuery plugin for mobile and desktop that adds pinch to zoom / mouse scroll zoom function to your images. These jQuery world clocks are easy to implement, easy to skin, and only require you to add 5 lines of code to your PHP. You can add as many clocks in as many timezones as you like. You can keep them in a grid or place them throughout your page as needed. Get your own easily customizable countdown script without any further JS knowledge! Count Everest is quickly integrated into your own markup. Simple 3D Coverflow is a fully responsive media 3D coverflow plugin that allows you to display media content with an unique original layout from a 3D perspective. Jumbo 7 is easy to use Fullscreen gallery including Kenburn. As navigation, you can use bullets/thumbnails and tabs in your choices. jQuery plugin with tons of settings that allows users to generate embedded youtube videos adjusting almost all imaginable options in an easy way, plus generating fancy playlists and share boxes. Completely configurable tiles and grids. All mobile friendly and responsive, both the layout and interaction. Use for navigation, galleries or just to make things tilt. equiMargin is a jQuery Plugin that will automatically smooth out the horizontal spacing between HTML elements by adjusting their CSS margins (left and right). This hover pack allows you to add animation effects to images, when it hovered. Also you have ability to add text, that will go over image, and this text also can be animated. Fluid 7 is one of the most complete image slider ever. It is built in latest jQuery and mobile compatible so anyone can easily use it without any restriction. And it is fully responsive and modern features like Video embed,Smart Lightbox are supported which make it more stunning. This is a jQuery plugin for dynamic water reflection effect. Add a realistic looking dynamic water reflection to any image with this script. A nice plugin from best jquery plugins 2014 collection. Royal Audio Player is a powerful responsive HTML5 mp3 player for your website that runs on all major browsers and mobile devices like iPhone, iPad, IOS, Android and Windows8. Bootslider is the ultimate premium Bootstrap Slider Plugin in best jquery plugins 2014 offering the capability to show images, videos, html markup and captions paired with modern and fancy 3D transitions. Stance is an unique & awesome navigation menu for Mobile Web or Mobile App designed with the awesomeness of CSS3 & jQuery. The best way to visualize data. JSONViewer is a user friendly, easy to use, lightweight, vanilla JS script written in OOP syle. You can use this script to visualize those ugly JSON text files in an interactive pleasant way. 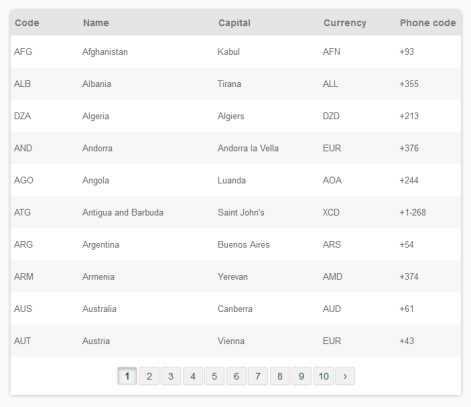 A small Jquery plugin (5 kb) which will allows user to sort table data in ascending or descending order. Tshirts designer & generator , Now your customers can create their own t­-shirts of their favorite team ( qualified to world-cup 2014 in Brazil ) ,directly on your website. Works with any kind of product and can be integrated in minutes. This jQuery integrated script in top jquery plugins (with some PHP files on a server side) lets your visitors to create custom avatars. The Avatars Generator is based on SVG (Scalable Vector Graphic), which is supported by all modern browsers and does not depend on screen resolutions. FerroLayers is a jQuery plugin that allows you to organize the contents of websites in a unusual and supersonic way and navigate through them with folding/zooming effects. Colio plugin will help you display details about your portfolio items in form of expandable viewport that can be placed above, below or inside your portfolio grid. Visual designer of sliders for your website. In the visual mode, you can create advertising sliders with animation effects and photo albums. Can be easily integrated with any CMS (not used database). FlexiNav is the most flexible navigation system designed to work on any device. It is fully responsive and comes with 10 color presets. Cube Portfolio is a powerful jQuery plugin in jquery best plugins that provides beautiful animated filtering, custom captions and it’s perfect for portfolios, galleries, team members, blog posts or any other ordered content. Display contents from different sources and display them in an unique environment. News Box is a responsive jQuery plugin meant to allow you to group multiple news and sort them by date. Master Slider is a premium image and content slider with super smooth hardware accelerated transitions. SlideScreen is a jQuery plugin in best jquery plugins that creates a “Before and After” effect from two images where you can drag a separator bar to reveal more or less of each image. It has several customization parameters and works on mobile devices. Field validation (JS, PHP and AJAX). HTML markup auto replace select, checkbox, text area, select list and file. Callback function (example : check unique e-mail or username). Notification message for error and success. jQuery Bubble Scroll is an easy-to-integrate navigation plugin in top jquery plugins collection that you can use on your website to display any kind of useful information. A first of its kind plugin in best jquery plugins 2014 to create a dynamic and responsive photo thumbnail wall out of your Facebook friends. Share content with friends just on a click of a tile. Use tons of animation effects to switch between tiles. 7 load animations. Animate a photo in to view in six different ways, pick from zooming in or out, fading, or rotating in various directions. 4 caption fill effects. 3 blur levels and a dreamy soft setting. 2 caption colors. bright and dark. This responsive video plugin gives you a professional, mobile-friendly solution for streaming online video players on your website. It’s lightweight, cross-browser compatible, and comes with built-in support for YouTube and Vimeo media streaming. Don’t waste time on adjusting width or width and height of bars for your chart. Use this Graph Plugin,Just add data of your columns and Your graph is ready!!! PhizzBoxXL is a responsive, fullscreen image viewer with many options to customize how it works and how it looks.